An amazing thing happened Jan. 2. Rather than watch college football, which is my usual New Year’s custom, the boys and I spent the afternoon watching the most compelling television I have ever witnessed. While in Florida last week on Christmas vacation at my parent’s house, my dad introduced me to Animal Planet’s “The Call of the Wildman.” In 30-minute increments, this reality show follows Ernie Brown Jr., AKA the Turtleman, as he travels around Kentucky removing unwanted animals from people’s homes, barns, ponds and storage sheds. Words cannot express how captivating this is. Add in some dramatic music, tight editing, skillful camera work, droll humor and Turtleman’s infectious enthusiasm and you’ve got a recipe for reality television at its finest. Debuting in November, the Call of the Wildman is gripping television because of the lack of pretension, the raw excitement of grabbing dangerous animals and the apparent lack of monetary reward. 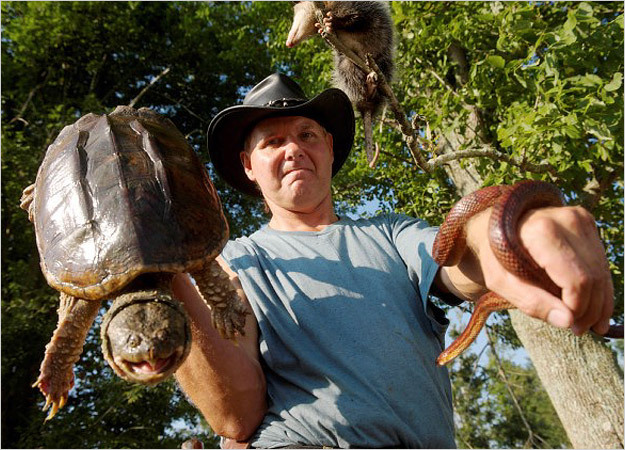 Turtleman’s payment is usually something like $35 and a homemade apple pie. So far the boys and I have seen him pull snapping turtles from a cow manure-filled pond, rescue opposums from a bourbon distillery, catch a fox in a hen house, wrestle a turkey terrorizing a farmer’s corn maze, pull several raccoons from their roosts in people’s homes, rig a trap to ensnare an infestation of rats, remove skunks from a tool shed and retrieve dozens of snakes from a theater. Perhaps the most amazing feat was grabbing a bat out of mid-air. Having dueled bats in my own house a time or two, I had the most respect for this display of skill. Why is this so compelling? Ernie Brown Jr. is a likeable hero. You pull for him. He seems genuine in his interactions with the people on the show. He’s a self-promoter, yes, but more for your entertainment than his benefit. His signature “Yeyeyeyeyyeyeye” rebel call and catch phrase “Live action!” pull you into the thrill of the hunt. 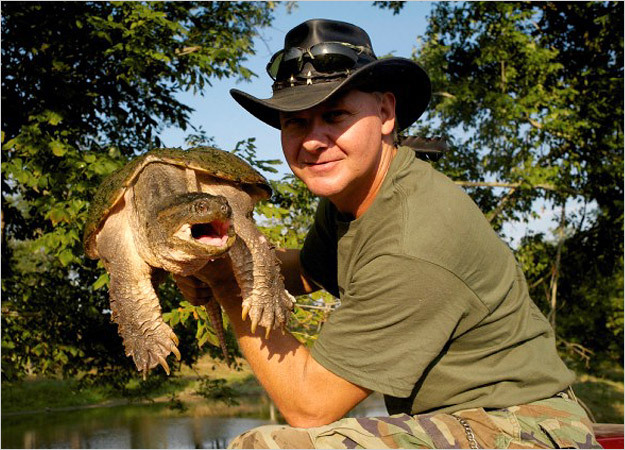 Watch this YouTube video of the Turtleman from Kentucky Afield in 2008, and you, too, will be hooked. It might even compel you to join his fan club on Facebook. But it’s not just Ernie. Neal is the perfect straight man. His droll quips, banjo playing and concerned pleas for caution add the necessary context for each assignment. Because Neal has long distance telephone service, he is the Turtleman’s self-proclaimed secretary, setting up appointments and booking appearances. And when the jobs are too big for the two of them, they bring in two more members of the Turtle Team: Squirrel and Jake. With Ernie’s faithful dog, Lolly, you have yourself quite a cast of characters. When I came back to work after New Year’s, I tried to explain to my co-workers how fascinating this is to watch. One friend from Kentucky was embarrassed by all the “toothless hillbillies” and what she viewed as a negative stereotype of people from Kentucky. But I think rather than mock them, the audience admires the Turtleman. Yes, his exploits appear insane, and he is missing quite a few teeth because of a run-in with a chainsaw. He is sincere. He is tender hearted. He has an appreciation for nature and a knowledge that can be acquired only from experience. So if the boys have found a new hero, I can think of a lot worse role models on television than Ernie Brown Jr. Yes, you can, as long as you make room on the sofa for me. This entry was posted in Uncategorized and tagged Animal Planet, contemporary South, Kentucky, Lance Elliott Wallace, Lance Wallace, Live Action, New South, New South Essays, NewSouth, reality television, snapperlicious, snapping turtles, South, Southern, Southern Culture, Southern Living, Southerners, the South, Turtle Man, Turtleman. Bookmark the permalink. ernie brown jr i want a pic of you with you and lolly dog in real life.